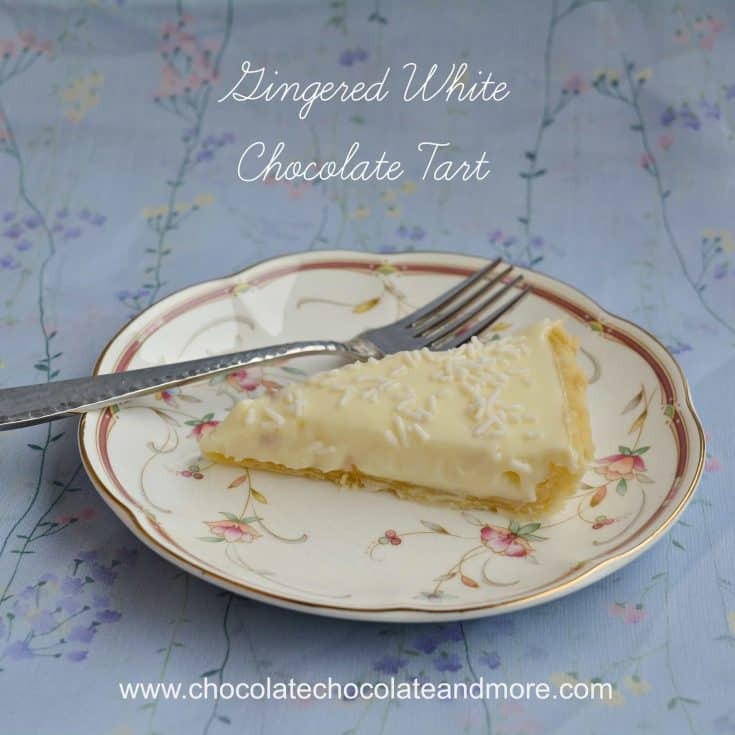 Gingered White Chocolate Tart - Chocolate Chocolate and More! 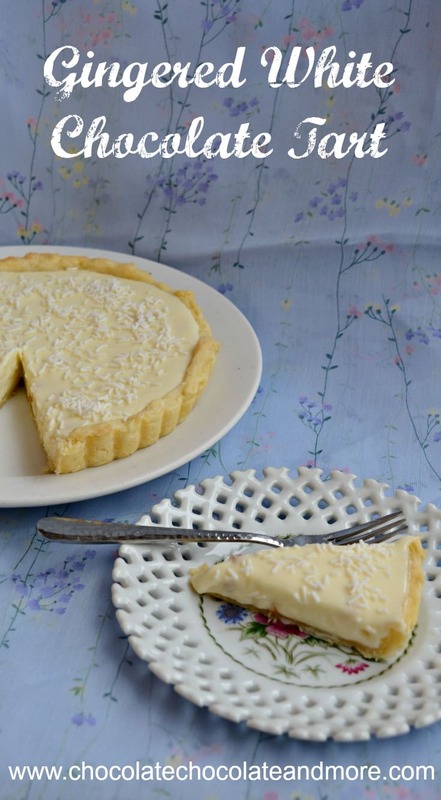 Crystallized (candied) ginger gives a little zing to creamy white chocolate in this Gingered White Chocolate Tart. This week is my friend Bernadette’s birthday. She’s a sweet Belgian woman who’s been doing charity work in Cambodia for decades. I’m not sure how old she is but she’s a mom to everyone. I knew I wanted to make her a special dessert but hadn’t made up my mind when disaster struck last week. The apartment upstairs had a water leak. They had no water in their apartment but I awoke on Monday to dripping wet walls and a large puddle in my bedroom. Turns out Cambodian apartments don’t have their own maintenance people and they only work from 8-5. The maintenance man couldn’t come until 4 so he didn’t figure out where the leak was coming from in one hour. It took them all day on Tuesday to figure out where the leak was and part of the day on Wednesday to fix it. I had to leave my windows open to let my room air out so the walls won’t mildew but that meant no air conditioning and temperatures have been around 80°F. So between repairs, missed work, and not a whole lot of sleep, I was a bit behind. I needed something quick, elegant, decadent, and cool for Bernadette’s birthday. Gingered White Chocolate Tart fits the bill. 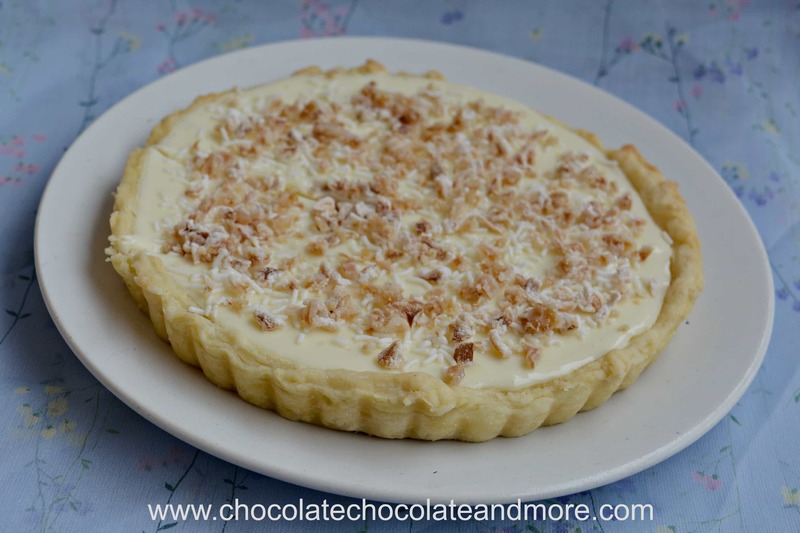 If you start the tart crust first, you can make the filling while the tart dough cools and then chill the filling while you finish the crust. Once everything is cool, it goes together in a flash. 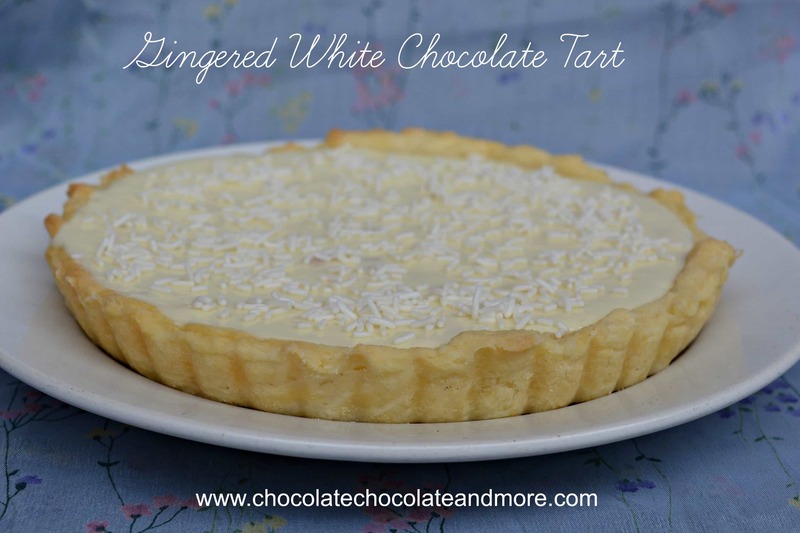 The filling for Gingered White Chocolate Tart is a simple mousse so you can also use it as a cake filling. It would be great between layers of spice cake, chocolate cake or cappuccino cake. At first I garnished mine with white sprinkles for a simple, clean look. But then I thought I’d add a few tablespoons more of the chopped crystallized ginger for some more spice. I like the look of the sprinkles better but the chopped ginger gives it a bit more color and spice. 1 cup plus 2 tablespoons whipping cream, divided. Combine dry ingredients for tart shell. Cut in butter until the mixture is fine crumbs. Add in egg yolk. Mix in just enough could water to make the dough stick together. Cover with plastic wrap and chill for 30 minutes. While you are chilling the dough make the filling. Lightly grease a 7.25" tart pan. Roll dough to ⅛ inch thickness and line tart pan with dough. The dough should be about ⅛ inch higher than the top of the tart pan. Chill 30 minutes. Use pie weights or line bottom of tart with parchment paper and use dried beans. Bake at 325°F for 20 minutes (until golden). Remove and cool. Beat remaining whipping cream until stiff peaks form (I chill my bowl and beaters in the freezer for 30 minutes before whipping cream). Continue beating while gradually adding the melted chocolate. Fold in ginger and vanilla. Refrigerate while you finish the crust. Spoon cooled filling into room temperature tart shell. Garnish with white sprinkles or more chopped candied ginger or both. Refrigerate until filling is firm. Serve cold. For a 9 inch tart, double the ingredients. I have not had candied ginger before but this tart sounds amazing! I need to try and find some! Thanks Nancy, You can make your own if you can’t find it. Slice fresh ginger and then Boil in sugar water (like making candied citrus peel). Does anyone have a recipe for a peanut butter cake? A lady friend of the family use to make my sister a double layer peanut butter cake and man them cakes were out of this world.